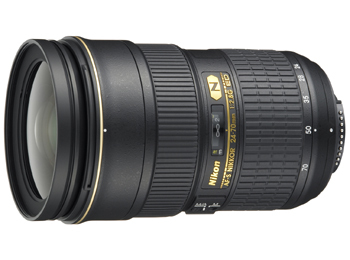 The AF-S NIKKOR 24-70mm f/2.8G ED Lens from Nikon is a fast aperture standard zoom lens designed for photojournalism and general photography with wide-angle to portrait length perspectives. 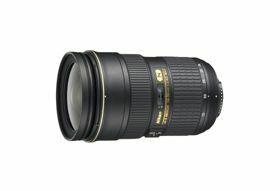 Optimized for edge-to-edge sharpness on both the Nikon FX (full-frame) and DX-format image sensors it provides the 35mm focal length equivalence of 36-105mm on DX-format cameras. The f/2.8 maximum aperture is effective in low light and creates a shallow depth of field with pleasing out-of-focus highlights enhanced by a rounded 9-blade diaphragm. The optical design includes three ED (Extra-low Dispersion) elements and Precision Glass Mold (PGM) aspherical lenses that help control chromatic aberrations while enhancing sharpness and contrast, even at the widest aperture settings. Nano Crystal and Super Integrated lens coatings enhance light transmission, reducing flare and ghosting. The internal focus system and Silent Wave Motor (SWM) feature provide swift autofocus with superior accuracy and ultra-quiet operation. Direct manual focus override enables fast and simple control over precise focus. Minimum focus is just 15" throughout the zoom range. This G-type lens does not feature an aperture ring on the lens body, resulting in a lighter and more compact lens. The filter diameter on this lens is 77mm and a large petal-shaped lens hood is included. Weather and dust resistant sealing add to its appeal as one of the most highly regarded and versatile lenses in the Nikon stable. Fast aperture standard length zoom lens compatible with both FX- and DX-format DSLRs. On DX-format cameras it offers a focal length equivalent to 36-105mm in the 35mm format. Versatile wide-angle to short telephoto perspectives and a wide maximum aperture, effective in low light, make this lens a popular workhorse for working professionals, enthusiasts and day-to-day shooters. Three ED (Extra-low Dispersion) elements and PGM aspherical lenses control chromatic aberrations and distortion while enhancing sharpness and contrast. Super Integrated and Exclusive Nano Crystal Coatings reduce ghosting and flare for even greater image clarity. The Silent Wave Motor enables smooth, precise and near-silent AF action.